There are four legislative assembly constituency in Sonbhadra district for the 2017 Assembly elections. They are 403 Duddhi, 400 Ghorawal, 402 Obra, 401 Robertsganj. When Uttar Pradesh assembly election 2017 is getting ready to electios new Assembly, Sonbhadra is not anywhere behind in the election heat. 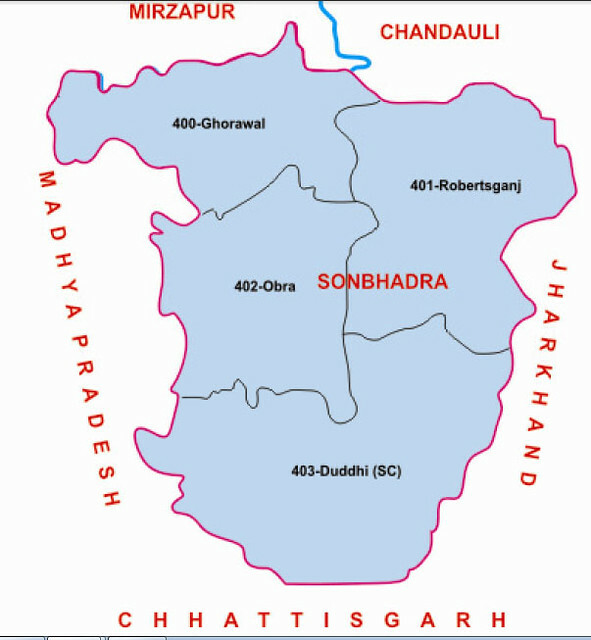 Sonbhadra or Sonebhadra is the 2nd largest district of Uttar Pradesh, India.Sonbhadra is the only district in India which borders four states namely Madhya Pradesh, Chhattishgarh Jharkhand and Bihar.The district has an area of 6788 km² and a population of 1,862,559 (2011 census), with a population density of 270 persons per km².It lies in the extreme southeast of the state, and is bounded by Mirzapur District to the northwest, Chandauli District to the north, Kaimur and Rohtas districts of Bihar state to the northeast, Garhwa district of Jharkhand state to the east, Koriya and Surguja districts of Chhattisgarh state to the south, and Singrauli district of Madhya Pradesh state to the west. The district headquarters is in the town of Robertsganj.Sonbhadra district is an industrial zone and it has lots of minerals like bauxite, limestone, coal,gold etc.Sonbhadra is called as Energy Capital of India because there are so many power plants.